Long before our modern day of music, reading, and underwater basket-weaving fans, there was King Ludwig II. Ludwig's story is a strange one. It is one of whimsy, of dreams, of fancies. It is also one of loss, madness, and tragic death. Join me as I wind the clock back almost 200 years. Also, this is the return of Provocative History, so yay! Ludwig was something of an anomaly even as a child. As the heir to the throne, tutors surrounded him, indulging his fancies yet keeping him in line with rigorous education and exercise. He was introverted, often daydreaming and keeping to himself. Ludwig distanced himself from both of his parents, but he fostered a closer relationship with his grandfather who was an eccentric. When he turned eighteen, he ascended the Bavarian throne in southern Germany. Following a disastrous pair of wars, the Prussian chancellor, Bismarck, forced Bavaria to join the German collective. Ludwig did, however, manage to retain his military and diplomatic corps, part of yet free from the rest of Germany. Yet the King was unhappy. With the loss of many of the rights he saw as rightfully his, Ludwig dreamed of the era of Absolutism. Those were the times when the King reigned with absolute power. As a result, Ludwig began to withdraw from politics. His exit from politics, however, might have been due to his personality. An introvert from birth, he avoided functions and parades with a passion. While this irked the rest of the government, he was popular with the people, whom he chatted with and gave elaborate gifts to. Though generous with the commoners, one might say that he rewarded artists even more lavishly. Within a couple months of becoming king, Ludwig brought Richard Wagner to his court. In modern times, we have all these different competing trends for popular media, different types of music or stories. Back then, the hip media of the time was the Opera, and Wagner ruled over the genre with expertise. Starting from age fifteen, Ludwig began to adore Wagner's works. You can imagine how he 'fanboyed' out when he saw Richard. Ludwig saw to it that Wagner kept working on his career. After Opera, Ludwig worked towards his magnum opus: his castles. In 1867, he visited the Wartburg (the castle in which Luther was imprisoned during the Reformation) and Versailles (his Absolutist obsession). He determined to build up his kingdom's architecture to be some of the greatest in the world. Ludwig poured millions of marks (German currency) into his opulent buildings. The most famous of these were the Schlösser (castles) Herrenchiemsee, Linderhof, and Neuschwanstein. This last castle is the most important of all. 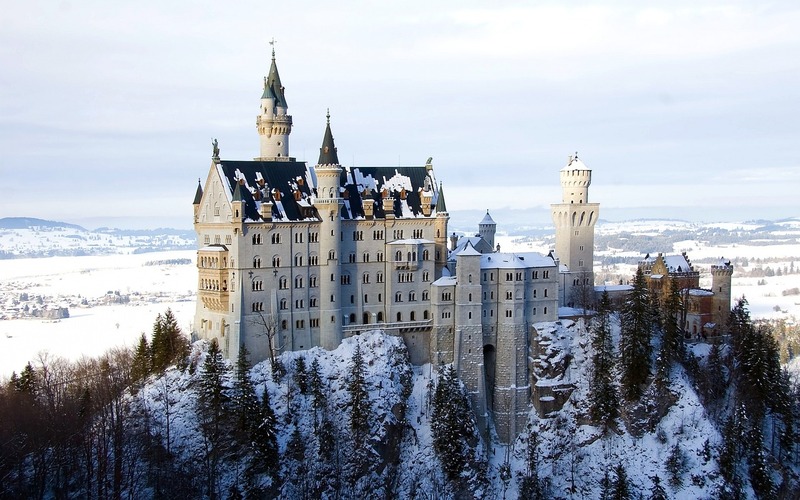 Ludwig built Neuschwanstein with the intention of it looking like something out of a fairy tale, and he certainly succeeded. From the snowy mountains of the Bavarian alps surge white towers crowned by royal blue spires. One hundred years later, it would serve as the primary source of inspiration for Disney's Cinderella castle. Far different from Disney's stories, however, were Wagner's plays. And scenes from Wagner's plays adorned the castles interiors from a plethora of different operas. Wagner commissioned several artists for paintings of Nordic legend (the source for many of the plays), in addition to sculptors to replicate a cave, and smiths for a golden dragon (small size). Have I mentioned Ludwig was a fanboy? Though Wagner's plays were his greatest infatuation, other obsessions preoccupied his mind as Neuschwanstein unfolded. With his throne room, his mind turned to Eastern Rome and Orthodoxy. His bedroom became the home of Gothic cathedrals. Nevertheless, though Ludwig may have seemed to live in the past, he had access to all the modern conveniences of the late 19th century. Plumbing, telephones, and electricity ran through the castle. Somebody had to pay the bill, however, and it sure wasn't going to be Ludwig. He kept determinedly borrowing more and more money, constructing elaborate buildings at a maniacal pace. 14,000,000 marks in debt, he continued without a second thought. His ministers attempted to reason with the king, trying to make him understand that the kingdom needed to be economized so that it could turn a profit. Irked and feeling aggravated by the rest of the government, he decided to dismiss the council. The council acted first. They fabricated claims of lunacy (none too difficult), and sought to impeach him constitutionally. After a month of struggling back, Ludwig was captured and brought to a town near Lake Starnberg. Here, psychiatrists initiated a retreat and recovery for the man. Some days later, the king asked one of the doctors to accompany him on a walk by the lake. Both were found dead the next day. Most stated suicide as the cause of death, but over the years, the evidence points to other causes, both sinister and natural. Some say they were shot or strangled, others that he was attacked by a stroke or heart attack brought about by the cold of the lake. No answer is perfectly clear, and it presents an intriguing mystery in the pages of history. Regardless of his death, Ludwig II was an influential man in modern times. Ironically, the architecture which once plunged Bavaria into debt have repaid themselves many times over and continue to be one of the greatest sources of foreign money for the country. A quirky fanboy with a strange attitude continues to affect the course of history in strange ways. I hope you enjoyed this snapshot of an interesting character!